Empress Effects – Reviews and More! 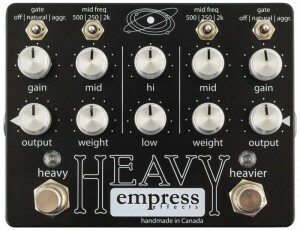 Home » Builder Talk » Empress Effects – Reviews and More! With the help of all our great members, the Pedal Finder database is slowly taking shape. If you sift through the database using the many search features you will see more and more results and piles of reviews on a slew of great pedals. The list of related artists and YouTube reviews is also growing at a rapid pace. So thank you all. One of the more recent additions to Pedal Finder is our page for Empress Effects. Founder and designer Steve Bragg started crafting stomp boxes for friends before he found out that others were interested as well. They have a wide range of pedals including the Germ Drive, the Superdelay, the Nebulus and the ParaEQ — just to name a few. These are the type of effects that inspire musicians to adopt new styles. And, they look pretty darn sharp too. In addition to new pedals, Pedal Finder member Adam left a great review on the Empress Effects Heavy, sharing his experience and laying out some of the pros and cons that is worth reading. Member BassEFX also puts down some sound reasoning on why the Empress Effects Compressor works well with bass rigs. We’re super excited to see members leaving their opinions on the site and hope to see more in the future. And, don’t forget that every piece of information you submit to Pedal Finder gives you one entry into the Pedal Finder give-a-ways, like the one we just had for the Golden Cello. So, don’t be shy. Get in there and let everyone know what you think about your favorite pedal. And, check back here (or just like our FB page) to stay on top of when future give-a-ways and happenings at Pedal Finder.